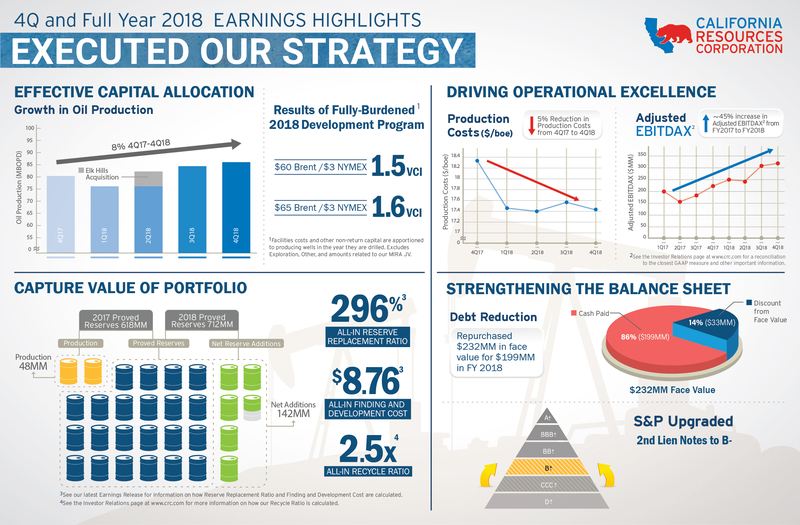 year $248 million in 2017.
production volumes, which results in higher production costs per barrel. quarter of 2018 compared to $33 million for the same prior year period. results, while JV partner Macquarie Infrastructure and Real Assets Inc.
quarter of 2018, which included interest payments of $157 million. other unusual and infrequent items. day and gas volumes averaged 202,000 MCF per day. million higher than 2017, due to exploration dry holes. million of GHG payments related to prior years’ allowances. in aggregate principal amount of CRC’s outstanding debt for $50 million. debt repurchases focused on CRC’s Second Lien Notes. in an all-in reserve replacement ratio of 296%. to oil price movements. See Attachment 10 for more details. reconciliations of the foregoing to their nearest GAAP measure. To participate in today’s conference call scheduled for 5:00 P.M.
fifteen minutes prior to the scheduled start time to register. Participants may also pre-register for the conference call at http://dpregister.com/10127347. will be available online in the Investor Relations section of www.crc.com. 10-K available on its website at crc.com.